In Metro Manila, billboards are a fairly common sight, but there’s something special about a new one that was just put up in Makati City. 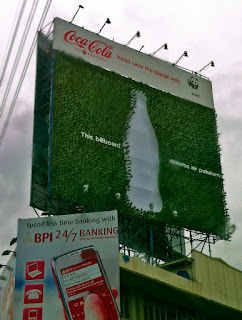 A plant billboard, the brainchild of Coca-Cola Philippines and WWF Philippines, was unveiled on June 23 and it’s a pretty unique one: It features Fukien tea plants, which absorb pollutants, and the plants are arranged around the outline of the Coca-Cola bottle. Each of the plants can absorb 13 pounds of carbon dioxide every year, and the pots are made from recycled bottles of Coca-Cola products.